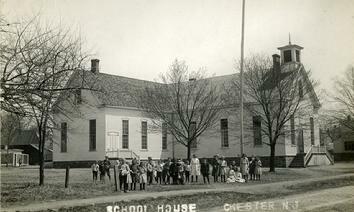 The first Chester School was moved to this location on Grove Street from Academy Lane and then added on to. When Williamson School was built in 1924, this school was then divided and made into four apartments and recently torn down to make way for an office building. Daniel Budd built this stone, 26-room house in 1868, as a home for his family and for the use of the Chester Institute, which was a private seminary school for young ladies. 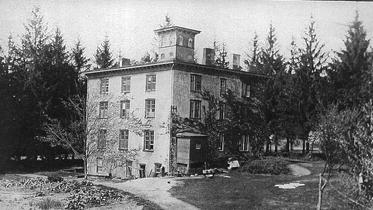 At the turn of the century, the Budd family changed the school into a boarding house. In 1945, William Mangels purchased it and started his candy business here and also took in summer boarders. In 1957, the house was sold again, this time to the Grogan family for the purpose of creating a nursing home called the Chester Retreat. In July of 1974, dozens of onlookers watched as workers destroyed the building to make way for a new shopping center. 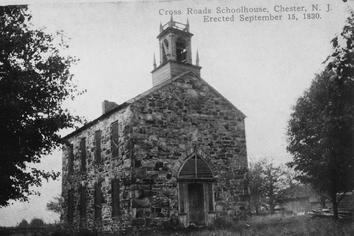 Benjamin McCourry and Nathan Cooper built this stone schoolhouse on Sept. 15, 1830 at what has been referred to as the Crossroads. The building is believed to have been jointly owned as the upper portion was used as a Congregational meetinghouse and the lower room was the schoolhouse. This was school district number two and Josephine Langdon was the teacher. Along Dover Chester Road, this old stone schoolhouse is now a private residence with a recent addition. This class posed for a picture in front of the Pleasant Hill School before the turn of century. 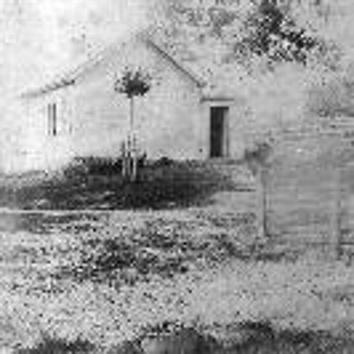 One schoolgirl was noted to have received a bible for regular attendance at this Pleasant Hill Sabbath School from S. White. Other names that this school located on Pleasant Hill Road was called were the Woodhull District School and District School No. 5. This schoolhouse is now a private residence owned by the Pederson family. This building was once the school for children from Milltown and some from German Valley. The old Milltown School on Parker road, now the Township Municipal building was so extensively remodeled in 1967 that the original structure is no longer recognizable. Prior to its purchase by the municipality in the 1930s, the old schoolhouse was owned by Ku Klux Klan who used the building as a meeting hall. Preserving the history of Chester, N.J.